"So Linda .. what did you do on your day off Thursday?" "A Tardis, it's a time machine." "A time machine - Time and Relative Dimension in Space to be exact." "Okay ... and exactly just why did you build a, what do you call it, Tardis?" "Amanda really wanted one for her birthday." "Well, a birthday cake that looked like one at any rate!" Yeah, I'm thinking that's probably about how that conversation would go were I to actually have it! For those unfamiliar with the British Sci-Fi television series that has been around almost longer than I have, Doctor Who features a guy (the doctor) who travels through time in the Tardis getting into all sorts of adventures with his sonic screwdriver and trusty sidekick. 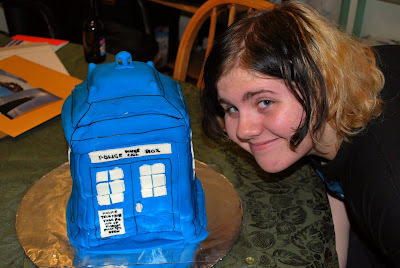 The show has become one of Amanda's very favorites and one of her requests for her birthday this year was a Tardis cake. 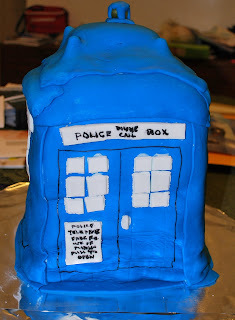 To be honest, I originally wasn't going to do it as I figured I had absolutely no talent when it came to cake-making - especially one that was supposed to look like a blue police call box! I had hoped that Mags would be able to come down from Boston and bail me out (excellent baker that she is) but alas, she had plans and couldn't make it. I then kicked around the idea of getting a digital picture put on a sheet cake at the local grocery store but in the end, after checking every internet source possible, I decided I'd take on the challenge and hope for the best. I decided I was ready but Thursday morning found me running out to the store for a couple more cans of frosting "just in case" as it had dawned on me late the night before that perhaps I wouldn't have enough. 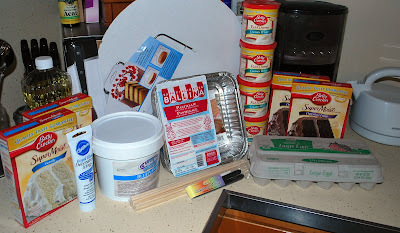 I had been lucky enough to find blue fondant online and a few other things I needed which was good because I had never ever worked with fondant in my life and I was a bit intimidated by the whole idea. The stuff is tricky to say the least! Ah, if only I could have made the cake that quickly but instead it took me about four hours all told. It wasn't perfect by any stretch of the imagination and I'm not sure how well it's going to look at the party this evening as once it comes out of the refrigerator it will probably be even more wibbly-wobbly and timey-whimey than it already is (I'm pretty sure I know what things I did wrong and should I ever take on this sort of project again will attempt to learn from those mistakes). The bottom line though is that Amanda seemed to love it and that smile was more than worth it! Now here's hoping Jamie wants something "normal" for her 16th birthday next month! Whoa! 8 layers? What a thoughtful Mom you are to tackle a Tardis! That's a whole lot of cake! You should have plenty to go through many time periods! I agree - her smile was worth it! What a great mom you are. Also, thanks for explaining what a Tardis cake is. I didn't have a clue. So is David Tennant popping out of the cake at the appropriate moment? Pretty darned cool, I'd say! And Amanda is really lucky to have a mother willing to go to such ends to produce a cake (and a video as well) of those dimensions! Great job on both aspects! Very original! Well done, Linda on coming up with that. Well I think you did a great job Linda and it looks just like the Tardis! I'm with Dianne. When I frost, the pieces of cake all come up with the frosting-spreader thingy. You did a fab job. I just watched the video over in FB land. And Amanda looks like one happy 17-year old! I echo all the comments about what a great mom you are...and how happy amanda looks. 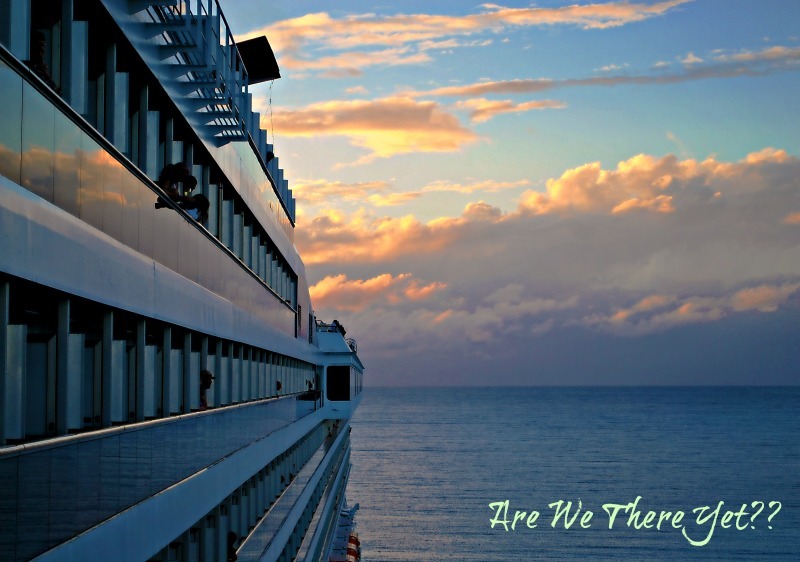 so what would you do differently?? You did an outstanding job on the CAKE. And since I haven't said it in awhile, you're also doing an excellent job as a mom. You get the mom baker award! Wow...that was lotsa work, but it sure made for a happy birthday gal. I'm impressed! Zuppa Toscana - The At Home Version! Rockin' On With Our Bad Selves!